The Essential phone is a device invented by Android co-founder Andy Rubin. Since leaving Google in October 2014, he has been working tirelessly on launching a smartphone that he claims could shakeup the tech industry. The Pixel was Google's exclusive innovation in the smartphone segment which left quite an impact. It is an incredibly audacious project and ambitious project, with an outlandish screen and the beginning of a modular ecosystem. Well, before we head on to the nitty gritty of the phone, I got the specs regarding the phone stacked up here for you to weave by! While buying a new phone, you obviously would not want it to get damaged, and may want to buy an external protective case for it. Mr Rubin doesn't think so, because the company says they will use titanium and ceramic materials, which are certainly among the toughest materials used in smartphones today. Plus Essential claims they have dropped the phone on solid concrete and the phone escaped unscathed. A device made of aluminium would not have the same fate, if faced with a similar scenario. And making a device with higher-end and stronger materials just like what you get in an iPhone or Galaxy device is a thumbs-up for me. The build quality is as expected of a typical flagship smartphone with a slim design. The fingerprint sensor is located at the back of the phone. Essential also believes in the modular accessory trend that Motorola jumped into with its Moto Mods for the Moto Z phones in 2016. The Essential Phone will contain two magnetic connectors on the back to attach external accessories which will contain a charging dock, a 360 degree camera and may be some extra which can be pre-ordered for the Essential Phone with an extra $50. There are a variety of colours in which the Essential Phone will be available; Black Moon and Pure White are available now, with Stellar Grey and Ocean Depth coming soon. And hanging on to the idea of shipping the phones with extraneous junk, the designers will not even put a logo on the exterior. The Essential Phone will just be splash proof - it wont come with any rating for submersion under water for a specified period of time. Samsung and Apple have made waterproofing on their flagships a great selling point and with such a high price, Essential really could have added this utterly ‘essential’ feature in their device. The Essential phone is certainly towards the high-end mobile phone market consisting mainly of the Apple iPhone 7 Plus and the Samsung Galaxy S8 and S8 Plus. Ditching the bezel on phones is the new trend in high-end handsets, and the Essential seems to entirely do away with the bezels, with some bezel on the bottom. The edge-to-edge display are present on all the sides. The screen wraps around the weird-looking front facing camera. 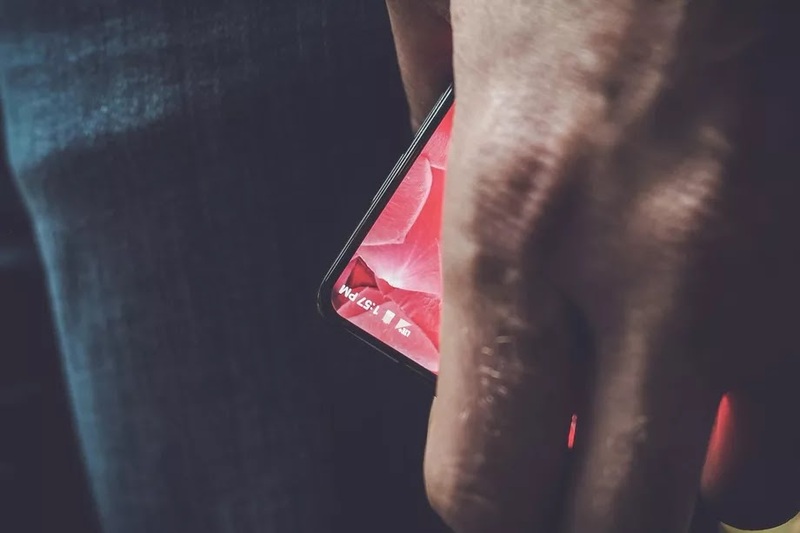 The Essential would feature a 5.71-inch 19:10 aspect ratio display with a totally different resolution of 2560×1312 with 504 ppi pixel density and offers Gorilla Glass 5 protection. The Essential Phone has a dual horizontal camera lens setup, with a main 13 MP sensor and instead of using the second lens for telephoto or bokeh, its using a monochrome sensor that helps the phone in low light situations, resulting in excellent photos. The rear camera is obviously featured to record 4K videos and has optical image stabilization. It features an 8 MP front-facing camera that can record 4K videos too! Essential also claims that their dual camera setup is the world's thinnest. As you are paying quite a lot for the Essential Phone, you certainly get the best hardware packed inside. That includes the latest Qualcomm Snapdragon 835 chipset with 4 GB of RAM with optional 64 or 128 GB of internal storage. We are encouraged by the fact that Essential says the phone will feature stock Android Nougat out of the box with no bloatware whatsoever. 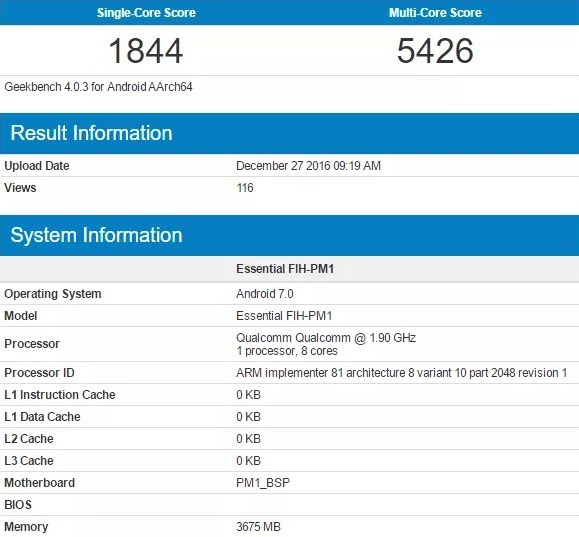 Rubin has confirmed in interviews that the Essential Phone will run a version of Nougat 7.1.1 that is “pure as the driven snow, with no bloatware or customized interface”. Hopefully that also means that the phone will get regular, timely and fast security and OS updates. It may, thus take Google’s lead and bring speedy updates and smooth performance to a third-party phone. This had to be made an important point here because the Essential Phone is said to be shipped as an unlocked unit and Essential claims that the phone will support all carriers with its wireless cellular technology. Some unlocked phones don't support CDMA carriers like Verizon or Sprint, so we are happy to see the Essential Phone will be able to work on all four major U.S. carriers. Continuing the trend which was first initiated by Apple, Essential has decided to ditch the good old-fashioned headphone jack on their phone to make it thinner. Although Essential will include a dongle for the phone’s USB C-Type port that will support wired headphones, the company should not have done that in the “Essential” phone considering it being an essential feature for me at least. Redemption may come in some sort if Essential provides other audio accessories like a 3.5 mm headphone connector that can be clipped on to the magnetic accessory port. This is a new feature and sounds quite interesting. Essential says the speaker automatically connects to new and existing devices. It will also support Siri, Google Assistant and Alexa, making it seem like the home speaker to rule them all. But without a price or a vague launch window, the Home Speaker is even further away from release than the phone. For all the attention it gets, there is a lot about the Essential phone that we don't know. One of them is the battery life. With a 3040 mAh battery, its around the same league as the Galaxy S8, but Essential doesn't tout any battery life claims on their site. Wireless charging is not available on the Essential phone. There is still a possibility of the phone getting a wireless charging modular accessory on the future, though. Iris Scanner: Like the Samsung Galaxy S8 or the Note 7, the Essential phone is not going to feature an iris scanner. Expandable Storage: Another essential feature, an expandable storage is not available on the Essential Phone, but the device will be available in 128 GB or 64 GB flavours. The unlocked model of the Essential phone (no-contract) costs $699. As such the cost is quite more than what most may be willing to spend.